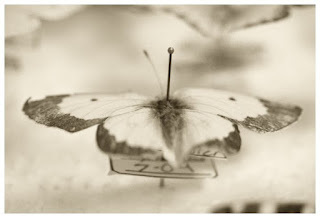 A friend of mine from school was a lepidopterist. He invited a group of us to view his collection. He really had quite a variety of butterflies, but I was horrified by it. Although I knew that the life cycle of butterflies are short, I was saddened by the fact that they could no longer fly around. Though no longer alive, they were forever held captive by the pins spreading their delicate wings. This morning I realized that often, we too, tend to be lepidopterists. We trap our free souring spirits and keep them pinned down with our obsession with the past. We keep all our past mistakes and hurts neatly pinned down in a display case and we constantly go back there to refresh our memories lest we forget our pain and the lessons learned. However, the result of this is that we can never be free of the past, we can never soar into the skies of our dreams and hopes. Holding onto the past is a sure way to deny ourselves the happiness which can only be found in the now, in this moment. It prevents us from celebrating what we have today. Instead of being happy and enjoying what is now, we again read the old newspaper of our lives in the hope that it has something new to tell us. The past is the past, nothing can change it, it is done. Let it be. Make a paper aeroplane or fold an origami butterfly from it and throw it into the wind. Let it float away and land in the water. Let the stream sweep it away. Release the dead butterflies of the past. They don't fly anymore. We have today, we are alive and we are breathing. Rejoice and be happy.